Burger Days III, the first Burger Days in a year, went off without a hitch this past Saturday, Feb. 19, and was a rousing success. 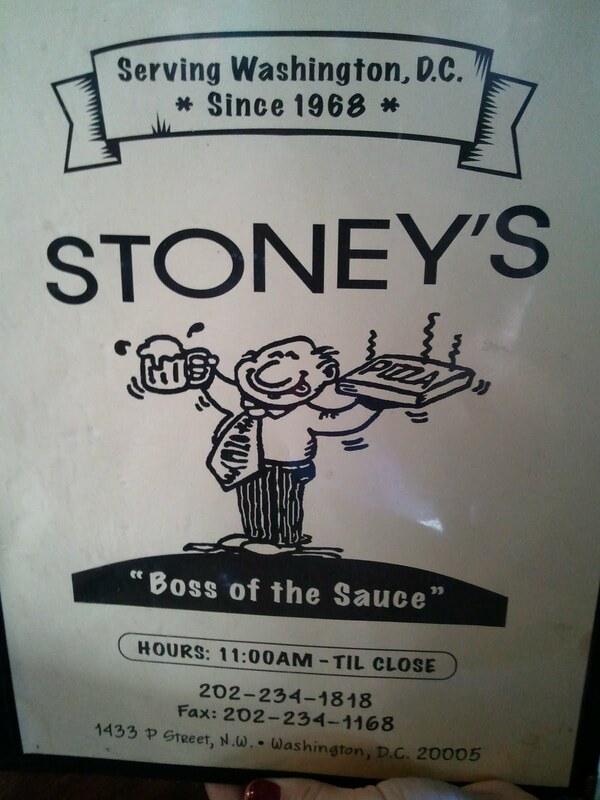 Stoney's Lounge was the first spot of the day and was bustling when we arrived at just after 12:30 Saturday afternoon. 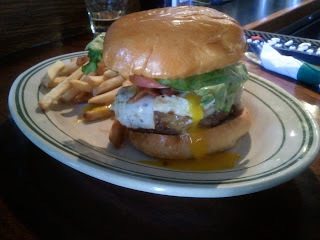 The Burger Days crew saddled up to the bar and placed our first order of the Burger Day. The selections included a couple of One Eyes (pictured right: burger with a fried egg on top), the Texas (slaw, grilled onions, bacon and BBQ sauce and the Stoney burger w/ Stoney's special sauce (tomato based with relish and horseradish). 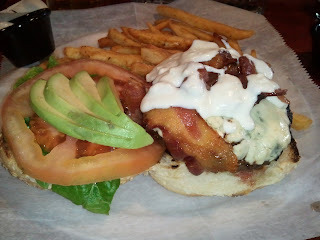 It was a consensus: these burgers were excellent. The beef was tender and flavorful, buns were choice and the toppings were spot on (the BBQ sauce is a winner). During our time there we also observed other dishes being served up at the bar including a ridiculously-sized meatloaf sandwich and some of the best looking French toast this side of the Seine. Stoney's will definitely be receiving a follow up visit. Next up, just a short ways down the street, we hit up Desperados Burgers and Bar. This tiny dive hooked us up with some solid, decent fare, but I think the group agreed Stoney's came out ahead. Here we were served up burgers of the Cajun (with Cajun Spice, grilled onions, lettuce, tomato, spicy mustard and mayo), Cheese Lovers (with cheddar, American and swiss) and Bleu Cheese (pictured, with Blue Cheese Crumble, Lettuce, Tomato,avocado, bacon and bleu cheese dressing) variety. Again, this place is small. And was not very busy. Good thing too as there was only one girl in the front who acted as host, waitress, busboy and bartender. To be fair, she did a fine job. She didn't mind when a member of the BD crew began belting out Toni Braxton ballads and she even gave us a brief tour of their electronic fireplace. We made a brief pit stop at The Saloon, a German-style bar, which started off positive, but ended on a sour note as the pretentiousness of the bartender was not lost on some of the Burger Days posse. We ordered no grub here, just German boozers. One thing's for certain, Jimmy won't be going back. 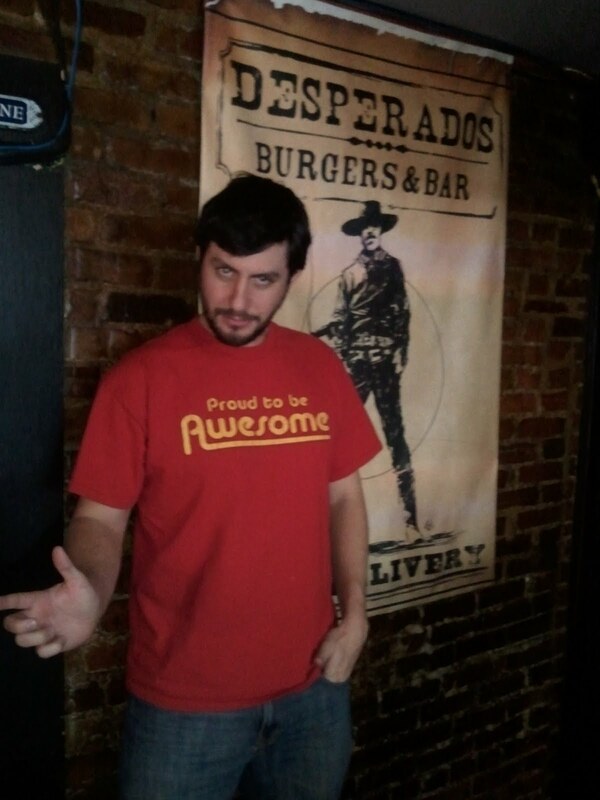 After we had knocked off the two pre-determined Burger Days spots, we were left with the audible. Where would we go for our #3 Burger Days spot? We considered Ben's Chili Bowl prior to The Saloon, but the line was out the door and around the corner so that was nixed. We decided to hit up 1905 Restaurant as it was just a block away and had been noted by on-line reviewers as a quality burger destination. A markedly different vibe from our previous two burger spots, 1905 was a more upscale, trendy spot, but we were well-greeted with not an ounce of pretentiousness (at least, from what we could tell). 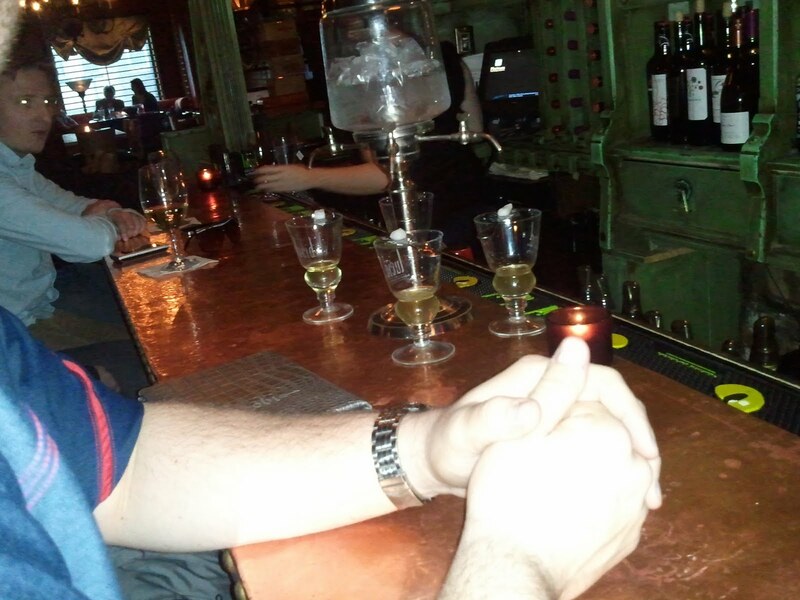 One of the first things we noticed in the dark and cozy bar was the absinthe. Two large, glass, ice cube-filled absinthe fountains were on the bar, just waiting for the Burger Days crew to put them in use. They didn't have to wait long as we ordered up a round and soon our bartender was lighting sugar cubes on fire and serving up our Green Fairy libations. Despite not enjoying my drink one bit, we ordered up another round. (In retrospect and my experience Sunday morning, it was not the best of ideas.). Anyway, onto the burger! 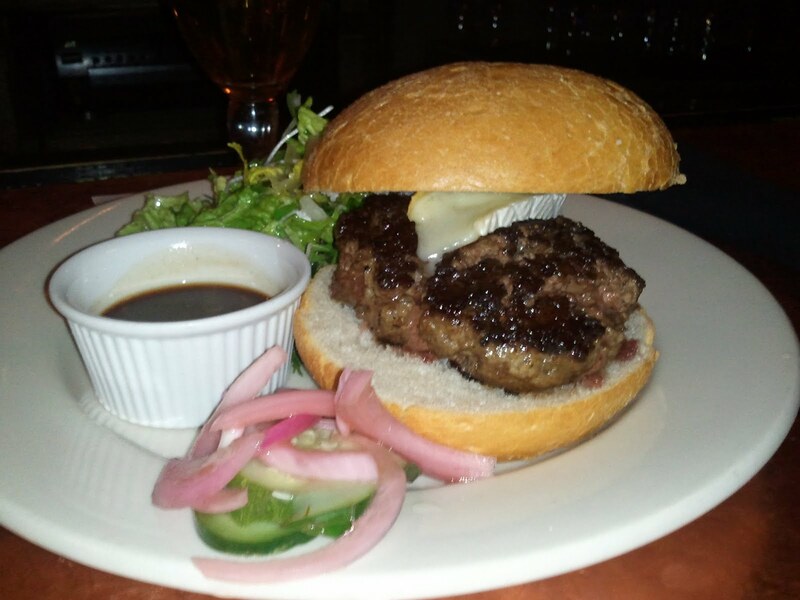 The burger at 1905 (pictured, right) was a winner: Angus beef blended with locally farmed mushrooms, topped with house smoked brie, and served with housemade pickles and greens salad. It was at least one Burger Days participant's favorite of the day. What made the experience even better was a visit from the chef who asked us about the meal, answered our questions about the menu and was genuinely impressed upon hearing of our Burger Days adventures. He let us know about half-price burger night on Wednesdays and, needless to say, this is another spot that we will be returning to. While the evening did not end there, Burger Days, in fact, did. With the most successful Burger Days to-date a wrap, planning on Burger Days IV is already well under way, including a possible first-ever Burger Days: Challenge! edition. Click here for more photos from Burger Days III. Check out a Tripline view of Burger Days III. This is first class journalism Jody!!!! I feel like I am ready to head back out ASAP. I've already got a few good ideas on the next ones…. It's gonna be great.